Gadsden, Alabama - You asked for it, you got it! Christmas at the Falls will extend its dates after the Christmas holiday. We’ll be open December 26-30 each night from 5 to 9 p.m. We had several rainout nights and we heard from many potential visitors that they didn’t get a chance to make it to our Winter wonderland of light displays, lighted train rides, visits with Santa Claus and more. 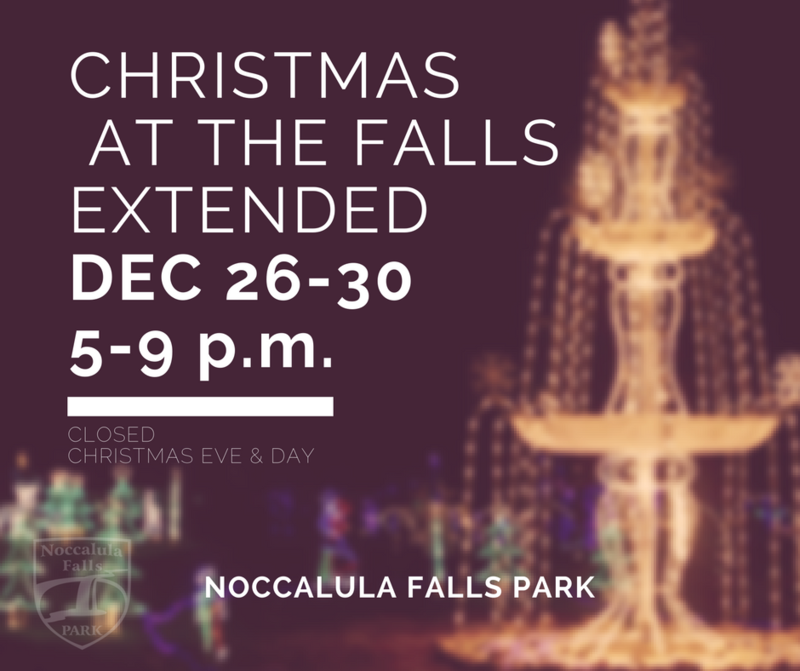 Stop by Noccalula Falls each night from now until December 30 (excluding Christmas Eve and Christmas Day) to enjoy the event. Children 3 and younger are free, 4 and older are $6. It’s an excellent time to get out of the house and take out of town guests to one of our biggest and best events. You can buy advance tickets for the whole family and skip the line by buying online at http://noccalulafallspark.com/ . We hope you’ll come join us in celebrating the holiday season and spend an evening at Christmas at the Falls. This year we’ve added light features and additional displays, so even if you’ve visited us before we know that you’ll enjoy your visit to Noccalula Falls for “Christmas at the Falls.” For more information and further details call 256-549-4663.